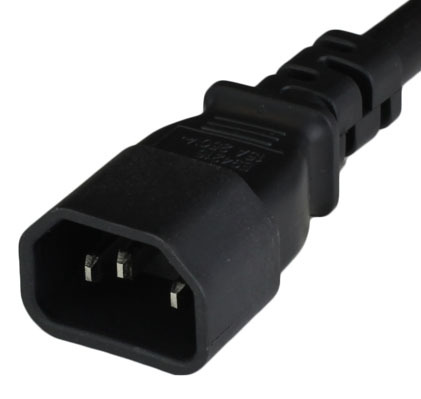 C14 to NEMA 5-15R Power Cables | World Cord Sets, Inc.
IEC 60320 C14 to NEMA 5-15R Power Cords are used to convert from a C13 Connector to a 5-15R (your standard North American Plug). These can be used in scenarios where you are required to plug a 5-15P into a PDU that only has C13 outlet receptacles, among other applications. The NEMA 5-1R connector mates with a NEMA 5-15P plug (the standard plug used in residential homes in North America. Rated at 125V and 15amps. The NEMA 5-15R connector is typically used in an extension cord or a cable adapter. The NEMA 5-15R is a 3 pin grounded connector, typically used in commercial and residential applications in North America. The NEMA 5-15R is referred to most people as simply, "the wall outlet" as it is found in every house in North America. The NEMA 5-15R is rated at 125V and 15A. The C14 to NEMA 5-15R is typically used to convert a C13 outlet into a NEMA 5-15R. In a data center, you may have equipment that is has a hard wire NEMA 5-15P cable, and, only have C13 outlets on your PDU. In these scenarios, this adapter cable is able to change the C13 outlet into a NEMA 5-15R outlet to plug in your NEMA 5-15P.